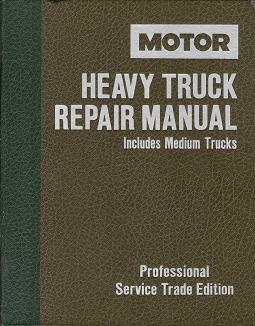 This edition of the MOTOR Heavy Truck Repair Manual covers mechanical specifications and service procedures on 1977 - 1985 Medium and Heavy Duty Truck models available at time of publication. Data reported in this manual is subject to change. To report current additions or revisions between editions of this manual, a "Manual Update" page is published every month for your guidance in MOTOR magazine. The data reported herein has been compiled from authoritative sources. While every effort is made by the editors to attain accuracy, manufacturing changes as well as typographical errors and omissions may occur. The publisher then cannot be responsible nor does it assume responsibility for such omissions, errors or changes.